Dan the NZ Heading dog at 4 years old—"He was rescued at 4 months old from a townhouse that thought he would make a good house dog pet. He had all the bad habits set in and took a bit of work to get him to come around to farm life on a small lifestyle block. He was brought home and once his behaviour and pack placing issues were corrected, for the first time ever he was released to the sheep to check his instincts. He promptly scooped around the herd, placing them into a group and then pushed them into a corner, then lay down and held them there awaiting further instructions. Great result. With further training he has come leaps and bounds and with the size of the property he now knows pretty much what to do with very little command. A high-energy breed that needs work before walks, as the walks alone have very little effect on his energy levels but are good for discipline and bonding. He has become a very loyal friend." The New Zealand Heading Dog is very intelligent and aware of its surroundings. It is able to be trained to a high degree. It was bred to use its eyes and quick movements to control sheep. It has the ability to perform in competitive levels in various sports, excelling in agility skills, obedience, sheepdog trials and Frisbee. These competitions are right up its alley. For those who wish to reach high levels in dog sports, the New Zealand Heading Dog is a gift from heaven. The New Zealand Heading Dog is highly energetic with great stamina. Provided it gets sufficient activity to keep occupied and ample exercise,the New Zealand Heading Dog will get along quite happily with other dogs and children. They should not be trusted with small non-canine pets, however there are plenty of New Zealand Heading Dogs that live and get along with family cats. This breed can be sensitive and should be very well socialized as a puppy to prevent shyness. To be truly happy, they need a lot of consistent leadership, extensive daily exercise and a job to occupy their minds. New Zealand Heading Dogs will often challenge their owners’ authority when they are adolescents. Dominance levels vary greatly, even within the same litter. You need to be this dog’s firm, confident, consistent pack leader, or he may try and take over. If you allow him to take over, without enough socialization and mental and physical exercise, he can be highly reactive and sound sensitive, making him a poor choice for families with young children. The New Zealand Heading Dog is a perfectionist with a permanent will to please. This breed lives for serving you day in and day out. It is not an ideal pet for people who do not plan to spend a lot of time with it. These dogs are too intelligent to lie around the house all day with nothing to do. If you are not willing to put many hours a day into keeping these dogs well exercised in both mind and body, then it is recommended you do not adopt a New Zealand Heading Dog. There are other breeds that are similar yet not as demanding. If there is insufficient activity then it will find its own work to do, and that may not be what YOU had in mind when we say the word WORK. When not challenged daily they can and will become destructive. They cannot be left alone for too long with nothing to do if they have not been exercised to the point where they are both mentally and physically tired. A bored New Zealand Heading Dog will not make a good pet, as it can become neurotic and may start using its escape artist talents, among other behavior problems. They have strong herding instincts and may try to herd children and strangers and must be told this is not acceptable. The New Zealand Heading Dog is not recommended for apartment life. They are very active indoors and do best with acreage. It needs daily activity and needs to see plenty of its handler. This breed is not suited to life chained up in the backyard. This is a very active dog that was bred to work; therefore it needs plenty of exercise and will do best with a job to do. Walks alone will not be enough for this breed. If you do not give it a job to do it will find a job on its own and it may not be what you had in mind. In addition it needs to be taken on a daily, long, brisk walk or jog where the dog is next to or behind the person holding the lead. Never in front as instinct tells a dog pack leader goes first. In addition, they will benefit from a place to run free in a safe area. 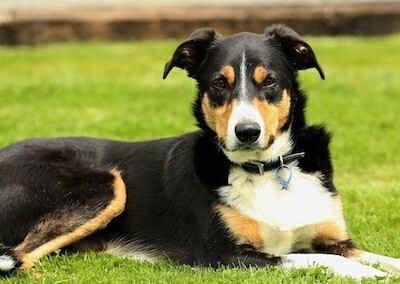 The New Zealand Heading Dog was bred from the Border Collie in New Zealand. It was bred with a shorter coat to combat the heat of the area. It was also bred to have less of an instinct to lie down than its Border Collie cousins.